Lord Carlile of Berriew, the Liberal Democrat Peer and senior barrister who is one of the three people named by the British government to pronounce on the security assessment of the Provisional IRA in the wake of the killing of Kevin McGuigan, has a secret job deciding whether the PSNI and MI5 are justified in withdrawing close force protection to members of the establishment in Northern Ireland, including senior judicial figures, who are under threat of dissident republican violence. His work has brought him into conflict with legal figures who have complained that Lord Carlile too readily accepts the PSNI/MI5 judgement that security force protection should be withdrawn from high ranking figures. The PSNI in particular is believed to be keen to reduce levels of personal protection, both for financial reasons and because the security threat against judges and other high profile targets has in the view of security experts diminished. 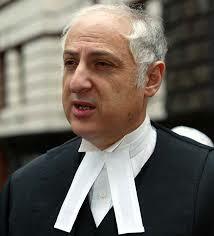 Lord Carlile – has a secret job as a one-man court adjudicating appeals against PSNI withdrawals of security protection to establishment figures, including top judges. Critics say he sides too often with the PSNI. Along with Catholic retired senior civil servant, Rosalie Flanagan and senior QC, Stephen Shaw, who is a born again Christian and believed to be the DUP’s nominee to the three person panel, Lord Carlile was appointed this week by NI Secretary, Theresa Villiers to review and pronounce on a PSNI/MI5 assessment of the current state of the IRA due to be delivered before mid-October. Close force protection involves armed police guards, drivers and home protection on a 24-hour basis, an expensive allocation of police resources. Given the reduced security threat and the need to save money, the PSNI is keen to scale down its commitment to providing this protection but in doing so it has raised establishment hackles. Lord Carlile, known as Alex Carlile, the Liberal Democrat MP for Mongomeryshire before his elevation to the House of Lords, is described in a Northern Ireland Office press release as “the independent reviewer of national security arrangements in Northern Ireland since 2007”. In actuality he acts as a one-man court of appeal when the PSNI decides to withdraw close force protection to figures previously regarded as potential republican targets, such as judges, senior legal figures like senior and junior Crown Counsels, and senior civil servants. These decisions often require the input of the British Security Service, MI5. 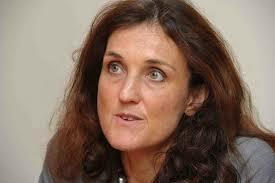 NI Secretary Theresa Villiers. One of her nominees to the the assessment panel believes every word in the Bible is literally true; another is accused of believing every word the PSNI utters….. Figures who have had their protection removed have complained, sources have told thebrokenelbow.com, that the withdrawal of protection has been premature and that a threat still exists. They say Lord Carlile is too often and easily inclined to accept the security forces’ judgement on such matters. The extent of the threat to judges, barristers working for the prosecution service, senior civil servants and other likely targets is, for obvious reasons, not a widely discussed or publicized subject. The secrecy surrounding the subject makes an objective assessment difficult, to say the least. But one example stands out. In September 2009, a pipe bomb was found outside the North Belfast home of Judge Seamus Treacy and he was forced to move to a safer location and sell his home. The Real IRA is believed to have been behind the threat. Judge Treacy was, prior to his elevation, a well known human rights barrister who accepted regular briefs from Madden & Finucane, a law firm founded by Pat Finucane, who was assassinated by the UDA in 1989 allegedly because of his republican sympathies. 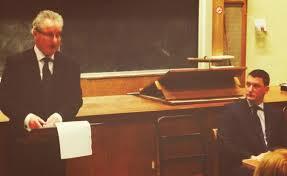 In the wake of the peace process, Judge Treacy accepted a seat on the bench. Whether the dissident threat extends beyond figures previously known for their role in defending Republicans but who have since decided to identify fully with the legal system, is largely an unknown, since for obvious reasons a cloak of secrecy normally covers such matters. But during the Troubles, the Provisional IRA regularly targeted judges and magistrates and common sense suggest that if the dissidents were capable they would try to do the same. Whether or not the accusation is true, the claim that Lord Carlile is overly inclined to accept the PSNI and MI5’s word on such threats, especially since the criticism emanates from members of the establishment in Northern Ireland, will raise doubts about his ability to be impartial if faced with a security assessment of the IRA that downplays its threat, or one that minimises the influence of the Sinn Fein leadership over the IRA’s activities. Whatever the truth, the decision to put the future of the Good Friday Agreement in the hands of three outsiders has already been complicated by revelations about the disposition of two of three named to make the decision. In the case of one nominee, Stephen Shaw, he apparently believes that every word in the Bible is literally true; in the case of another, Lord Carlile, he stands accused of believing every word uttered by the PSNI. Whatever the truth, it is not the most auspicious of starts for Theresa Villiers’ panel.